Authorizes the State or a county to obtain ownership over a road by condemnation pursuant to the State’s powers of eminent domain. The purpose of this measure is to address questions regarding responsibility for the repair and maintenance of privately owned highways. The purpose of this bill is to allow counties the ability to make short-term investments with similar authority as the State Director of Finance. The purpose of this measure is to cap the annual allocation of Transient Accommodations Tax revenue to the counties. The purpose of this measure is to make a $3 million appropriation from the Tourism Special Fund for travel expenses and subsidies incurred by the intercollegiate athletics program of the University of Hawaii. The purpose of this measure is to prohibit smoking in a motor vehicle when a minor is present. Makes it unlawful for a person to sell aquatic life acquired through spearfishing. Makes permanent the annual $103,000,000 allocation of transient accommodations tax revenues to the counties. Requires the establishment of a state-county functions working group in 2022 to recommend the allocation of transient accommodation tax revenues between the State and counties based upon the division of duties and responsibilities for the provision of public services. Allows transient accommodations brokers to register as tax collection agents to collect and remit general excise and transient accommodations taxes on behalf of operators and plan managers using their services. The purpose of this measure is to allocate to the counties 45 percent of the remaining transient accommodations tax revenues after adjustments to the Tourism Special Fund, as recommended by the State-County Functions Working Group. The purpose of this measure is to amend certain policies regarding the facilitation of public participation and input. Maui County capital improvement projects. Dec. 30, 2015, Civil Beat: Should Counties Get Bigger Share Of Hotel Tax Revenue? 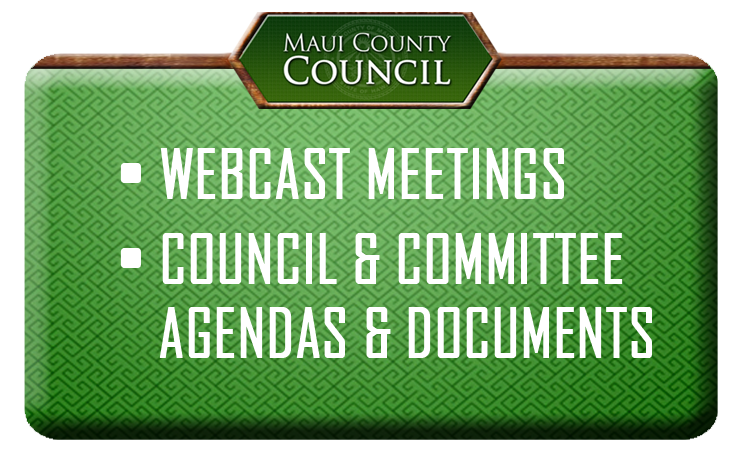 The 2016 Maui County Council Legislative Package is composed of four state bills. The Hawaii State Association of Counties is also considering a separate legislative package. Bills from the 2015 session are also still considered “alive” and are listed below. See complete list and status here. A resolution requesting the Hawaii State Legislature urge Hawaii’s congressional delegation to propose and pass and amendment clarifying that corporations are not people with constitutional rights, and that unlimited campaign spending is not free speech.